What’cha see? 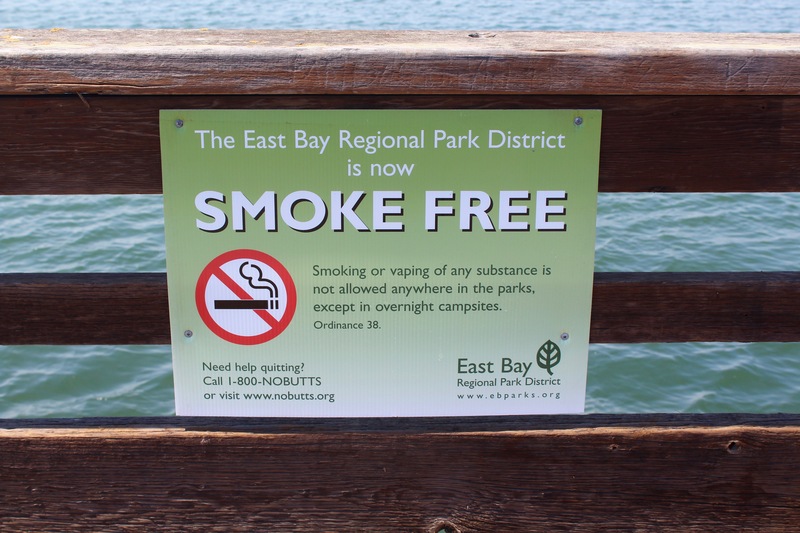 That grammatically incorrect greeting was directed at three gentlemen who were intently staring into the water from a small bridge that almost adjoins the Arrowhead Marsh Pier, one of the two piers located in the Martin Luther King Jr. 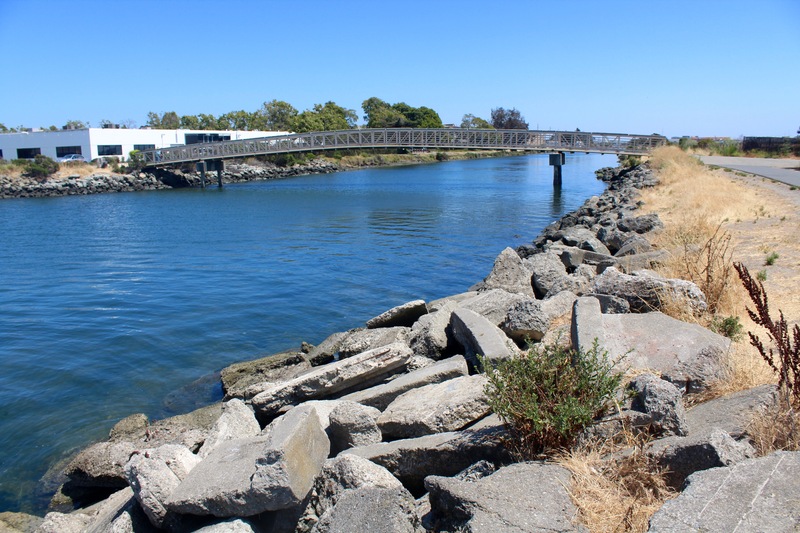 Regional Shoreline area, this pier and the Doolittle Pier (see separate article). What had grabbed their attention were three small bat rays that were swimming slowly around the shallow, probably less than two-foot-deep water. I joined in the ray watching! They were small bat rays, less than (I guess) ten pounds each and they were in no big hurry; sometimes they were gliding along, sometimes just resting on the bottom. I suppose they were searching out food but maybe they were in a group swim fest? Eventually the humans moved on while the ray remained in their watery wonderland. The sight reminded me of two things: water in this area is often fairly shallow and bat ray are one of the most commonly encountered fish. Environment. 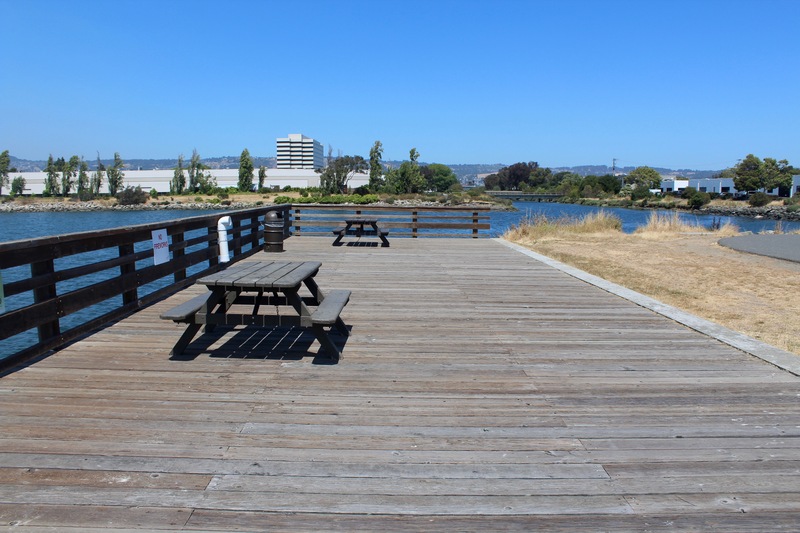 The Arrowhead March Pier, called by some the San Leandro Creek Pier, is located in the northeastern section of the area, adjacent to both Arrowhead Marsh itself and to most of the park facilities. 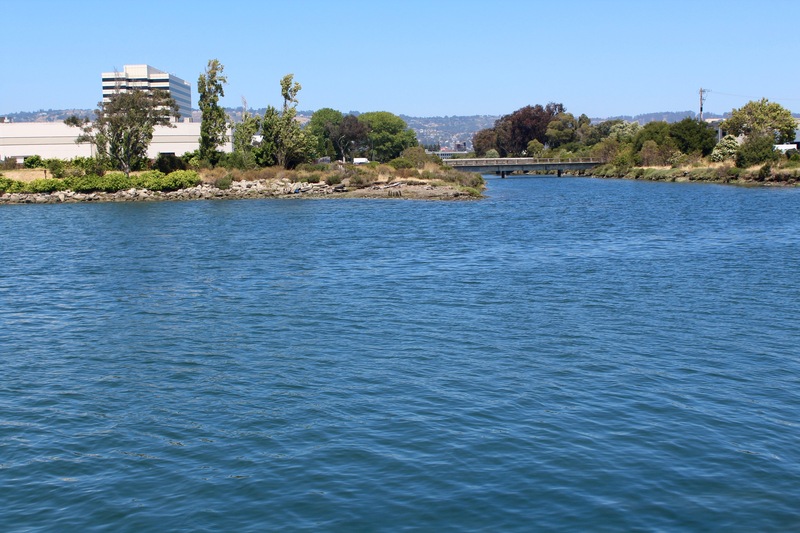 To the right of the pier, San Leandro Creek and Elmhurst Creek meet and flow into San Leandro Bay. The small creek containing the bat ray sits almost behind and to the left of the pier and that’s where its waters flow into the marsh. Straight out and to the right sits a channel of the bay and to the left is the marshy area. The pier was constructed in 1983 and is supposedly 175 feet long but I think that is actually the width, not the length. In fact, the pier hardly sticks out over the water. Because of its size and location, anglers are presented an environment that has a mud bottom and somewhat shallow water. Many piers see their pilings covered with barnacles, mussels and a mélange of small critters living amongst those mussels. Here, given that the pier’s pilings are mainly submerged only during high tides, there’s little growth on the pilings except barnacles. Thus the pier does not really attract inshore fish like perch and striped bass and it’s hit or miss fishery. Most anglers simply cast out into the deepest water they can reach and hope for the best. The most commonly caught bottom fish are staghorn sculpin (bullheads), kingfish (white croaker), and a variety of perch. Year round can see hoards of small shinerperch that are too small to eat but are good bait for stripers and halibut. Winter to spring months can see the larger pileperch, white seaperch and a mix of whichever perch have entered the bay. The most common perch year round is blackperch (sometimes called buttermouth) while occasionally the larger rubberlip seaperch will make a showing. Sharays, sharks and rays, are numerically among the most common bottom fish. Bat rays, small babies under 10 pounds in weight up to the big mama bat rays approaching or even exceeding 100 pounds in weight, make these waters home. Personally I release all bat rays, they are neat creatures that are commonly seen in “petting pools” at zoos and aquariums. Both leopard sharks, to nearly five-feet in length, and the smaller brown smoothhound sharks, are also common. Once in a great while another shark species might be encountered but they are more common to piers fronting deeper water. Two flatfish show up at times. Starry flounder occasionally make an appearance in winter months while California halibut may show up during the May to September months (but don’t hold your breath). Local anglers tell me they have seen a few white sturgeon landed but I personally haven’t seen any of the diamondbacks at the pier. Nevertheless, you just never know. Jacksmelt and topsmelt are also common and they are usually caught mid-depth by anglers using a float. 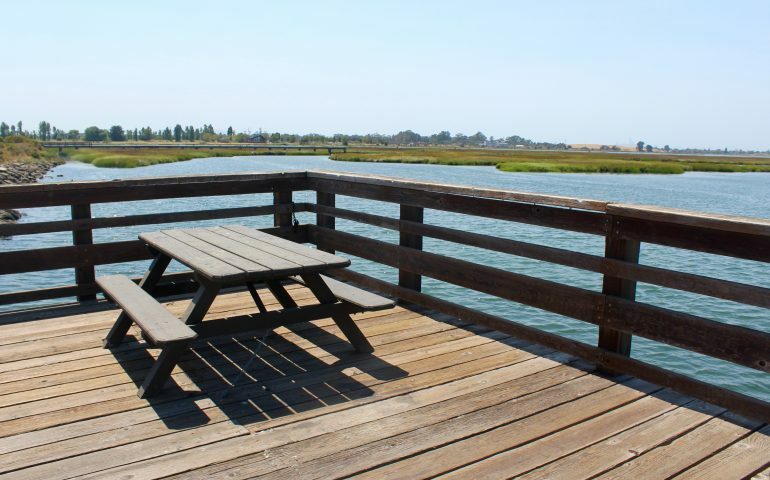 The 50-acre Arrowhead Marsh section of the shoreline park is not only home to this pier but is also a great place to have a picnic, a place to do some bird watching, and a place to explore a marsh, the nursery areas for many of our fish. It is also a great place to simply rest and relax. It’s somewhat of an outdoor oasis in this heavily industrialized section of the East Bay. A quick glance through the trees to the east reveals the nearby Oakland Coliseum (officially the Oakland-Alameda County Coliseum, a place given a number of name changes over the years including the dumb (to me) name O.co Coliseum for a period of time). Fishing Tips. 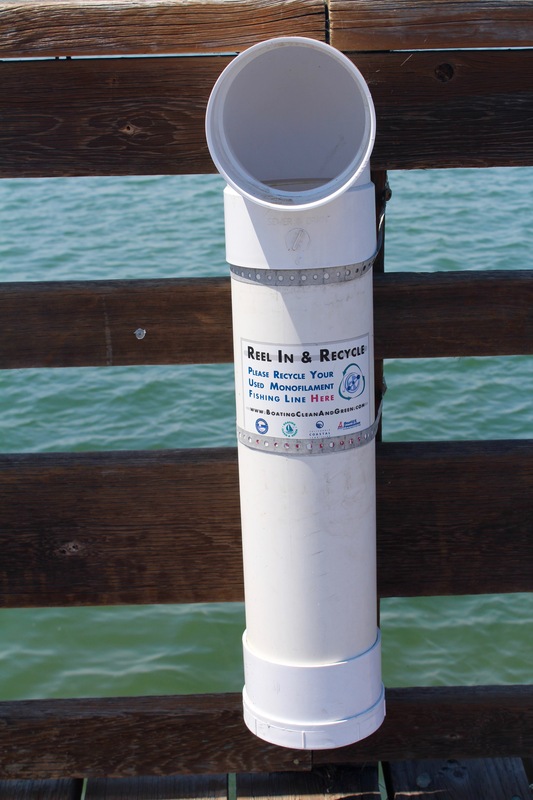 Remember the seasons when you are fishing Bay Area piers! In the winter and spring fish for flounder and/or perch; use pile worms, grass shrimp, ghost shrimp, clams or market shrimp, and fish on the bottom using fairly small hooks (size 6 or 4). The winter and spring will see some large pileperch (as well as white, black and rubberlip seaperch) while shinerperch are a year long resident. Do remember the April 1 to end of July perch closure (although it’s OK to keep up to 20 shinerperch). Fish during the summer and fall for most of the other species. White croaker will be one of the most commonly caught fish but jacksmelt numbers may also be high when a school moves through the area. The white croaker (kingfish) are normally caught on small pieces of anchovy or squid while jacksmelt can be caught on a multi-hook leader (no more than three hooks) fished with a float and small pieces of pile worms. For many anglers, summertime represents the prime time for sharays—sharks and rays. The sharks like an oily/bloody-fish dinner such as sardine, anchovy or mackerel, while the bat ray prefer squid. Summertime is also the time for the pier’s favorite fish—striped bass. The bass generally prefer a live bullhead or mudsucker but small shinerperch will also work and some locals swear there is nothing like a dead bullhead all covered with slime. But, given the small size of the pier and proximity to the water, many anglers will be out plugging away for the stripers. A plethora of lures are used, everything from the old fashioned but still effective Hair Raisers to spoons and soft baits. Halibut, if they make an appearance, prefer lively bait such as a small shiner. Date: September 13, 1998; To: Ken Jones; From: Tony G; Subject: New East Bay Striper Hotspot? Ken, Let me start by thanking you for your fantastic California pier fishing report! It’s great to be able to log on to the net and be able to plan each fishing trip with the click of a mouse button. Hopefully, I can repay you by filling you in on some inf. that you may or may not already know. I read in your book about the piers located in San Leandro Bay (Martin Luther King Jr. Regional Shoreline). In it you mentioned that the fishing there was slow and inconsistent, at best. Well, I think that may rapidly change. I was there last evening and witnessed something that I have not seen there before (the last time I visited the area was almost a year ago). The East Bay Regional Park District has finally completed the restoration of the wetlands at Arrowhead Marsh. At high tides the newly restored marsh floods with water from the bay. Just after the turn of the tide, all that water drains out again through a tiny (15-20 ft) channel next to one of the piers there. Along with the rushing water, hundreds of tiny bait fish schools are flushed into the Oakland Estuary. Waiting for those bait fish are marauding schools of hungry striped bass. Too bad I didn’t bring my rod with me last night as the water just EXPLODED with hundred of tiny fish skipping across the surface and dozens of stripers jumping after them. It was enough to nearly send me into the water after them. An elderly gentleman I met there said that since the new channel into the marsh was opened, scenes like that were becoming more and more common. I hope he’s right! If the stripers keep making that kind of a showing each season, that tiny little wooden deck next to the channel could become a top-notch California pier! Ken, If you do go, I have two quick tips for you. First of all, the stripers showed-up after the turn of the tide. I was there Saturday night (9/12). I don’t know what the time for high tide was that night, but the water started to rush out of the marsh at about 7:00 PM. By 8:00 PM the water was gushing out at full force, and the stripers were in a frenzy. This should be a public pier that does not require a license. I’ve changed the information at the top but will be contacting park officials as to why they say a license is required. Okay, now I know exactly where this spot is. I came there maybe (10) years ago but turned around because it was getting dark. Not easy to find because you could pass it right by. A mapping address would be 80 Swan Way. I never reached the pier in the very back down the road (until now). The parking lot is a stones throw from the wooden pier. The bridge across the canal is just to the right of it. Note: my gps took me to the parking lot of Digicom which is right on Parder across thr canal. I walked over the bridge but got in my car and drove all the way around to the correct parking lot for EBRP. Standing on the lookout point, I realized that I had been here for a music video shoot some (20) years ago for a Too $hort music video where we had the entire main park to ourselves on a rental agreement. The part I like, and am more familiar with is the entrance where there is a small parking lot and fishing area that looks across at Doolittle Pier which is much more obvious in its location. I have looked over from Doolittle and have seen people tossing lures in hopes of striper. 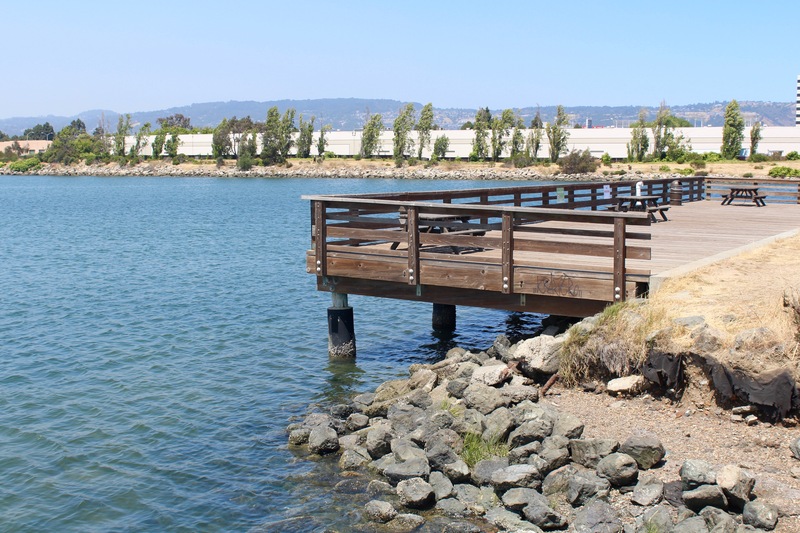 Shonuff88, The East Bay Regional Park District confirmed today that this pier and the pier on Doolittle Drive should be considered public piers and you should not have received a ticket. The “fisheries” man at the East Bay Regional Park District also said you would probably win if you contested the ticket. But, I told him that I thought you had already paid the fine.